Anyone familiar with racing history knows the name Jim Clark. With Team Lotus, he took the company's first Constructors' World Championship and won Rookie of the Year in the Indianapolis 500 after coming in second after Indy legend Parnelli Jones. All in 1963 and all in the Lotus 25. Technical problems kept him from winning either race in 1964, but he returned to win both races in 1965 in the (then) new Lotus 38. 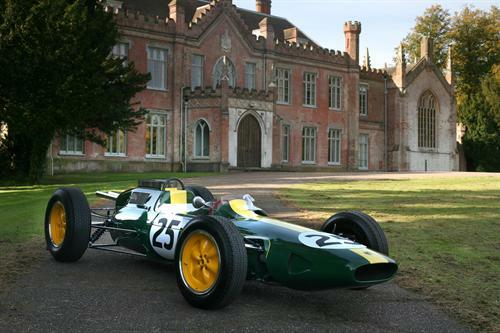 The beautiful and immediately recognizable Lotus 25 that Clark piloted to victory and acclaim will be the centerpiece of the Team Lotus display at February's 2013 Race Retro showcase in the UK, one of the world's largest historical racing shows. Also on display will be the backup Lotus 25 used in trials and testing by Clark. A true Renaissance man of racing, Clark won 33 pole positions, 25 races out of 72 total races in Grand Prix and still holds the record for total wins on both counts. He also won the British Touring Car Championship in 1964 while driving a Lotus-Cortina. In 1968, the Scotsman was killed in a racing accident during a Formula Two event in Germany. He has been placed at the top of the list of the greatest Formula One drivers in The Times in 2009. Also making a debut at the Race Retro will be Sir Stirling Moss, probably the most-recognized Grand Prix Team Lotus name in history, who will be there on Saturday, February 23rd. Moss is most well known for his long and dominating career in Formula One behind the wheels of many cars, including Mercedes-Benz, Maserati, and others. His first win, however, was in the Grand Prix piloting a Lotus in 1960. Iconic F1 commentator Murray Walker will also be there on Saturday and Sunday. Both Sir Moss and Walker will be on the live stage to take questions and answers and will also be available for autographs. Several other Team Lotus and enthusiast race vehicles will be on hand for perusal as well. The Race Retro show starts on Friday, February 22 and runs through Sunday the 24th at Stoneleigh Park in Coventry. Information is available at RaceRetro.com. Those were the days of racing, pioneering and gentlemen drivers and they also heralded the end of an era when almost anyone with talent could get behind a wheel and prove themselves.